Abby was on her own this week; Ben has been under the weather. Latte: This week Abby focused mainly on the Ebbtide Knitalong shawl and the Rocky Coast Cardigan. She's also about to cast on a pair of Hickory socks for one of her teachers. Stir: Abby has been spinning along with The Spin Doctor Podcast's Jacey Boggs Spin Art spinalong. More spinning: Abby learned to use a high whorl spindle and can finally enjoy both her Bosworth and her Golding drop spindles. Taste: Review of Knitting Never Felt Better by Nicky Epstein. Take a Bite: What have you done or would you like to do with "art" or "textured" yarn? Caffeinated: Abby was very excited to read the article "Your Brain on Fiction" and urges you to read it! As a result, she has jumped into Stephen King's lastest book 11/22/63. Demi Tasse: Abby just bought a new pair of "Dimrs" for those pesky headlights. 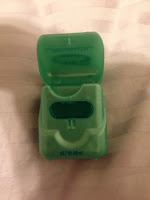 Tip Jar: Abby is using this dental floss case to carry a supply of crochet cotton. Unclassifiable: Knit a Uterus! Find out why and how here. Barista's Special: Elizabeth Doherty kindly extended the discount for Ebbtide. You can find the discount code on the ravelry thread for the KAL. Grande: Abby finished the Meisi gloves. Sadly, Shalder is still waiting for buttons. Ben has finally had photos taken of some of his projects! Check out ravelry. Chai: Cupcake Throwdown: Hello Cupcake vs. Bonjour Cupcake. Bonjour wins by a bite. Abby went to the New York City Ballet at Lincoln Center and was transported to blissful ballet land. Brewing: Abby marvels at the wonders of gauge and that sweaters ever fit. Menu: Ben made deep fried burritos, sushi and mango lassi. Abby make chocolate pudding from scratch. Stir: Abby talks about Judith Mackenzie's class on recycling cashmere. You can find an article that explains everything about this in the Spring 2012 issue of Spin Off. Abby has joined the "Spin Art" spin along sponsored by Sasha Torres of the Spin Doctor Podcast. Steamed: Abby has been deeply offended by a KIA commercial. She contacted the company and urges listeners to do the same. Note: Curiously, I could not find the commercial online the way it's being shown in New York City. Hmmm. Caffeinated: Ben is reading Debt: the First 5000 Years and says it's one of the best books he's ever read. He is also excited about Streetlight Lullabies, new music by Toh Kay. Abby's reading Crisis Economics, a Crash Course in the Future of Finance, a great book that explains the recent crash. Ben also recommends The Giant Pool of Money on This American Life, and both recommend the movie Inside Job.